leaf of light-colored natural travertine. We’re all familiar with the tales from the Brothers Grimm, the 19th-century German authors whose stories still haunt and entertain us today. Their work – “Rumpelstiltskin,” “Cinderella,” “Rapunzel,” “Snow White,” and “Hansel & Gretel,” for example – still is being adapted into new books, movies, and TV shows today. And the brothers themselves are getting a little more recognition in their home country in the form of a new museum. The Grimmwelt Kassel museum – a reinforced concrete and natural stone structure (Gauinger Travertin) – at the Weinberg in Kassel, Germany was designed to present the Brothers Grimm’s works. It translates the historical and topographical features of a surrounding park into a continuous open space and invites visitors to explore the exhibitions at their own pace. On display are a multitude of presentations about the Grimm Fairy Tales, the brothers’ biographies, and even personal artifacts from their homes. 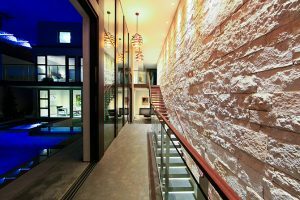 Of course, at Masonry Design we are more interested in the structure itself. When we heard about the museum, we immediately contacted the architecture firm, kadawittfeldarchitektur, to find out more. The museum is located in the picturesque Karlsaue Park. 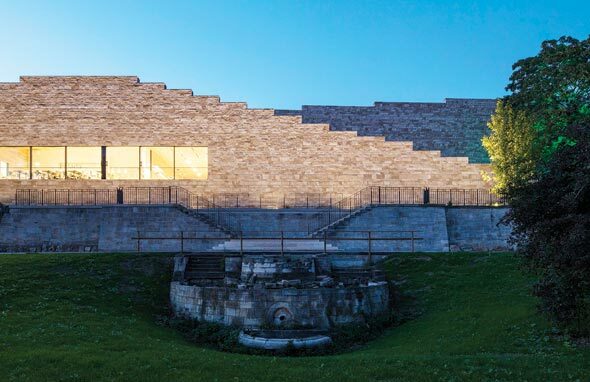 According to the firm, the museum is located in the picturesque Karlsaue Park on the slope of an area called Weinberg close to Kassel city center where it blends into the gently undulating landscape. Old stone steps, wall fragments, pergolas, planted terraces, and lush vegetation contribute toward the special atmosphere of the park. The new museum continues the topography of the surroundings in an accessible roof landscape and thus provides the park with an open stairway that leads up to a terrace with a view across Kassel. This design leads to a split-level arrangement in the interior. The tiered space is arranged around a central hall presenting the various key subjects of the exhibition. Visitors experience a place with diverse atmosphere and one that focuses on German linguistics as well as the collection of the Grimm Fairy Tales. The foyer with a reception desk, a shop, and waiting area is a long space stretching the full depth of the building. It ends in a light café with a panorama of Karlsaue Park and the southern part of the city. 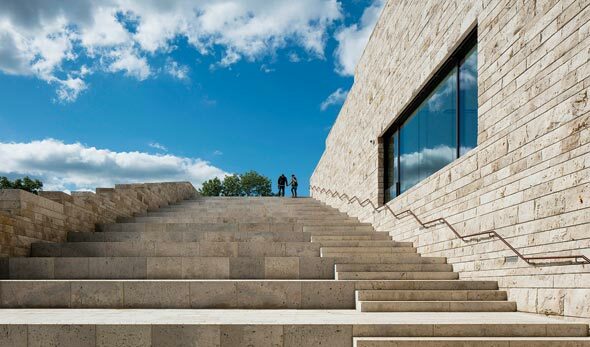 The museum follows the topography of its surroundings with an open stairway that leads up to a terrace with a view across Kassel. The terraced roof of Grimmwelt Kassel. The reinforced concrete structure has an outer leaf of light-colored natural travertine, roughly split with courses of varied height. 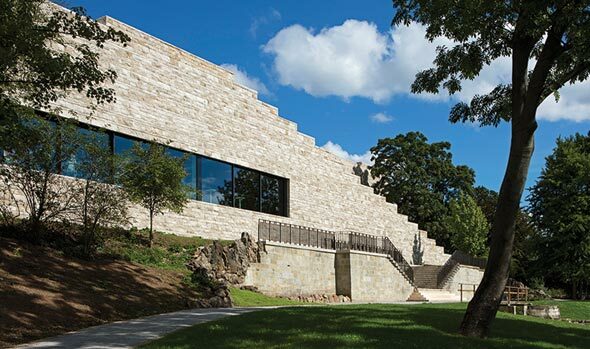 The choice of material is reminiscent of the former so-called Henschel Haus, the firm says, which was destroyed by an air raid in 1945 and was situated where the new museum now stands. Stone relics of an old stairway and wellhead are a reminder of the Haus, and will continue to be part of the new garden on the museum grounds with the effect that the new build is not only embedded in the urban landscape but also in the history of the landscape. 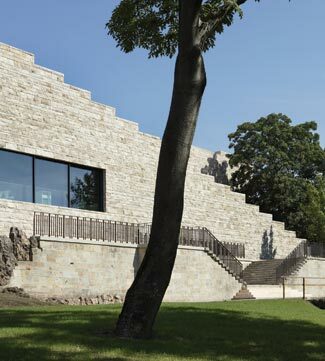 Furthermore, the choice of material reflects properties of the local limestone found under the existing hill, once a vineyard. 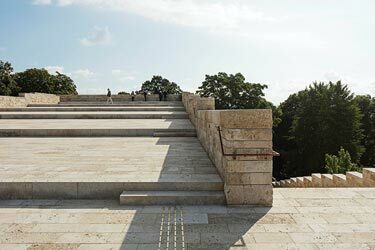 “The building protrudes from this slope like a further rampart and literally invites visitors to explore and clamber the broad and slightly tapered stairway embedded in the southern facade that leads up to the roof: an accessible area ten meters above the ground measuring 2,000 square meters and designed as a rising terraced landscape,” kadawittfeldarchitektur says of the Grimmwelt in a news release. “The exterior walls are drawn up beyond the roof level as parapets and stepped to match the level of the roof landscape. A variety of events can take place on the spacious terrace – even outside opening hours – in order to make up for the valuable space lost to public use by the museum. Exterior view of the museum from Karlsaue Park. 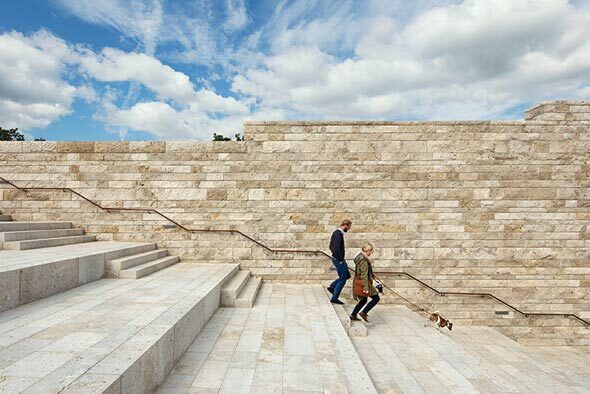 The ups and downs of paths through the terraced park, the stairways and alternating levels are continued inside – in a sense, it is a building designed to persist with its environment and not only in it, the firm says. It is a museum that does not only want to present contents, but also mediate their existence in a playful way, adopting the visitors as participants and providing them with an aesthetic and multifaceted framework for the experience. Once inside, visitors not only are rewarded with impressive vistas of Kassel, but also with fascinating interior design that functions on multiple levels. The most fascinating room, the firm says, is the introductory room to the left of the foyer. It is positioned in the center of the building, spans four levels, and has two very specific functions. Its full-height, pearly white and fine-grain plastered walls are used as projection surfaces and are thus part of the exhibition. But more than anything else, the space functions as a distributor; this is where visitors start to understand the impact the terraced structure has on the interior’s arrangement, kadawittfeldarchitektur says. There are no conventionally stacked levels, but staggered planes designed according to the split-level principle. The height of the introductory room allows views into all four publicly accessible areas of the museum, thus connecting the different contents within the 1,600-square-meter exhibition space. Further, the sloped ceiling of the café traces the outdoor stairway on the southern side of the building. Oak paneling has been used as a reference to the frequently repeated theme of the forest in the Grimm Fairy Tales. The ceiling in the foyer, as is the case for all other areas in the museum except for the offices and ancillary rooms, also is sloped; right angles are an exception throughout the entire building. Most floors are finished in light terrazzo. The exhibition areas have a life of their own due to the clear layout of space and can therefore be devoted to a variety of different subjects. The small windows on level 1 only allow diffuse light to penetrate into the exhibition space. Levels 1 and 2 accommodate the permanent exhibits. 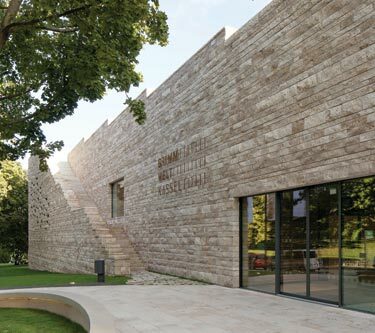 The museum concept designed by Holzer Kobler Architekturen and hürlimann+lepp is organized according to individual letters and terms taken from the Brothers Grimm’s German Dictionary. The entry-level area also provides access to the highest level (E1) with 400 square meters for changing exhibitions and a ceiling with white lamella panels. Another view of the unique exterior walls of Grimmwelt Kassel. The Marble Institute of America (MIA) has launched a new online resource library. 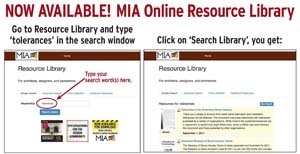 For the first time, all MIA technical documents will be available in one easily-accessible location. The official city slogan for Overland Park, Kan., is “Above And Beyond. 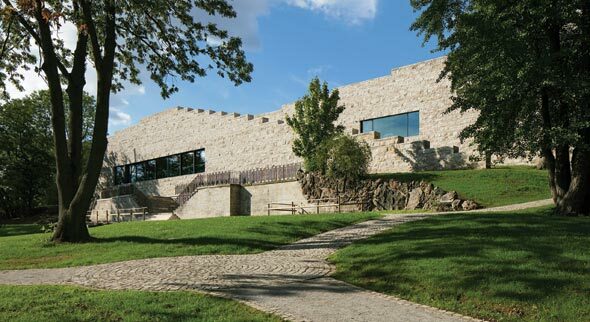 By Design.” A quick review of the area’s recreational facilities, entertainment complexes, museums, and other architectural gems, and one realizes that Overland Park’s planners, architects, and engineers take this slogan seriously.